Have you visited the Seven Wonders of the Ancient World? On my last voyage with Azamara Club Cruises, we toured one of the Wonders, The Temple of Artemis. I loved it. What a blessing to be able to walk through the footprints of history. Located in present-day Turkey, The Temple of Artemis was a Greek colony near the ancient city of Ephesus. The original polished marble still lines the paths at Ephesus. I wonder if they knew that marble would last forever when they built the city? The temple took more than 120 years to build and was finished in 550 BC. Its dimensions were 425 feet high and 225 feet wide, with 127 60-feet-tall columns. Interestingly, the temple was destroyed by arson on the same night Alexander the Great was born in 356 BC. The Temple of Artemis eventually was rebuilt but met its final demise in 401 when it was destroyed by a Christian mob. It is a miracle to peek at ancient times. In today’s connected world we can instantly access news, opinions, finances, and relationships. Interesting to reflect that for 99.9% of our human existence on the planet, life has been about pure culture, art, theater, philosophy, and literature. These are the same things that make human life meaningful now, but we take instant access for granted today. Ephesus is a city in a time capsule. Thanks to an excavation started in 1923, on our Azamara shore excursion we were able to observe archaeologists mapping the ruins. In the housing/dwelling exhibit, we watched an artist piece together history. I found it fascinating that people lived so close together, as opposed to today, with aviation, technology, and electronic communication allowing us to live far apart. I didn’t visit on this voyage, but the other Ancient Wonder in Turkey is The Mausoleum of Halicarnassus, located in the present-day city of Bodrum. Built in 351 BC, the mausoleum was the tomb of Satrap Mauslos, a Persian who helped create the beautiful city of Halicarnassus. For nearly 4,000 years the Great Pyramid was the tallest structure in the world. It was constructed for the Egyptian Pharaoh Khufu between 2584 and 2561 BC. The actual existence of the gardens is still debated, but they’ve been described as exotic animals and plants reaching heights of 75 feet. Their location would have been in what is present day Iraq. Created in the 5th Century BC by Phidias, the Greek sculptor who also lent his talents to the Parthenon, the statue was 40 feet tall. Zeus was moved to Constantinople after the rise of Christianity. An earthquake destroyed it in the 5th or 6th Century AD. This was a statue of the god Helios and was over 110 feet tall on the isle of Rhodes in Greece. It was built between 292 and 280 BC and is believed to have stood only 56 years before an earthquake toppled it. This was completed close to 300 BC and stood on the island of Pharos in Egypt. It used a mirror to reflect the sun in the day and fire at night to guide ships. It, too, fell victim to an earthquake. During an AzAmazing Evening in Ephesus, I reflected on what a privilege it was to listen to the Aegean Chamber Orchestra in the same amphitheater the ancients did. What a delight to spend enjoy a concert in Ephesus with my fellow Azamara Journey guests. An AzAmazing Evening in Ephesus. That may be my favorite AzAmazing Evening of all with Azamara Club Cruises. A fellow cruiser from Norway had told me that I was going to be in for a treat. I sure was! This was a very memorable moment in my life. 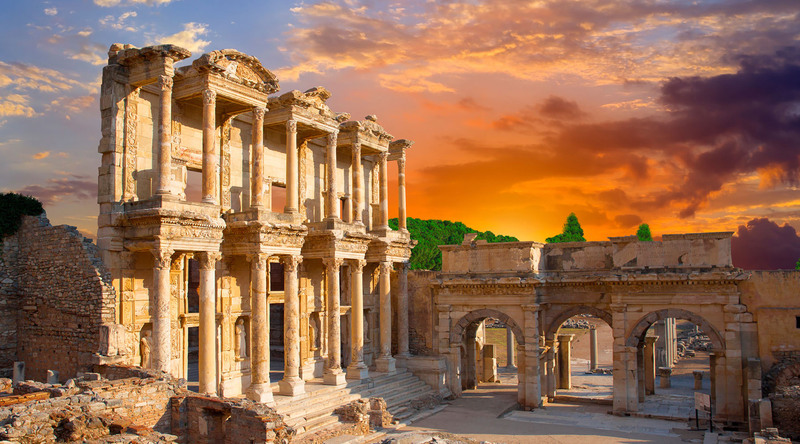 Browse upcoming Azamara cruises to Kusadasi (Ephesus), Turkey.